Pass up bland TV dinners or boring microwave hors d’oeuvres. These heat-and-eat pot stickers make an exciting appetizer or help build an easy-prep meal—and are full of good-for-you ingredients. 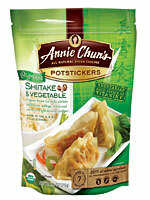 The taste factor: Chopped shiitake mushrooms, cabbage, carrots, and onions wrapped in a soft, steamed wrapper keep these vegetarian pot stickers fresh and light. Just a bit of soy sauce, ginger, and garlic seasoning keeps the flavor mild enough to complement a spicy dipping sauce or a light soy sauce. Pan-fry or steam in the microwave straight from the freezer to eat. The health factor: Brown rice, tofu, and lots of veggies pack these pot stickers with a balance of high-fiber carbs and protein (8 grams per seven-piece serving) for just 240 calories. Pair with a salad and steamed edamame or rice for a quick meal, or enjoy alone for a healthy appetizer. Editor’s pick: I drizzled with a spicy peanut sauce (just mix creamy peanut butter with a bit of soy sauce and crushed red pepper) to kick up the heat. Bonus: The nut butter adds healthy fats and protein! Why we love it: This easy-to-prep classic is full of nutrient-rich veggies and filling lean protein—for a quick and easy appetizer or the start to a flavor-packed meal.